Okinawa is coming into the season for bigfin reef squid! 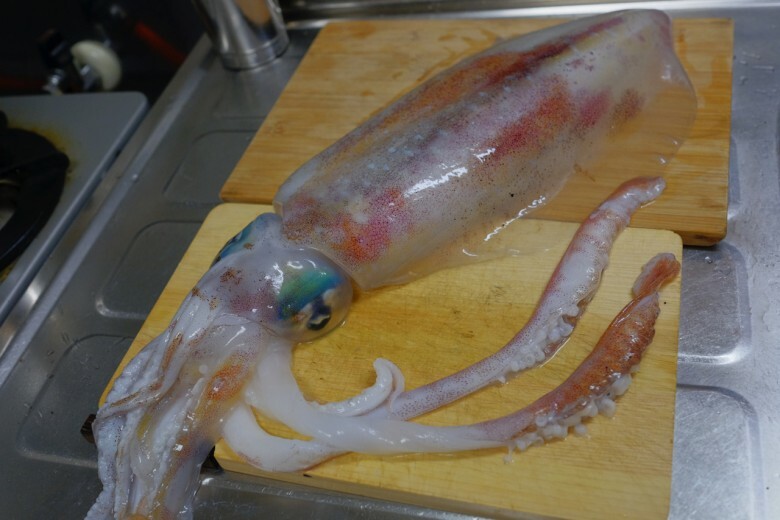 This squid can grow over 5kg here. This one is a small 2kg size. This was my only catch for yesterday. Squid fishing is still new to me. I need to improve my fishing skills on it because this squid is so delicious! It’s good in any style of cooking. 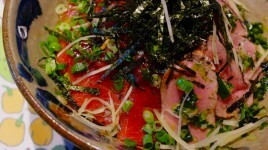 Sashimi, pan-fried, deep-fried, soup, boiled, grilled, you can’t go wrong. It can be a leading actor or a supporting actor in a dish. And it doesn’t lose its quality by freezing!!! Saving the ink and the liver of course. The ink, liver, fins and some tentacles are going into the dumplings. And we are going to have a little bit of hull for sashimi tonight. The structural fibers are running horizontally. So slice it horizontally if you want to enjoy firm crunchy texture. Slice it vertically to cut the fibers if you want to enjoy soft texture. Slice diagonally if you can’t decide. I feel like going crunchy today. This is a rather small squid, and the fibers can’t be that hard. 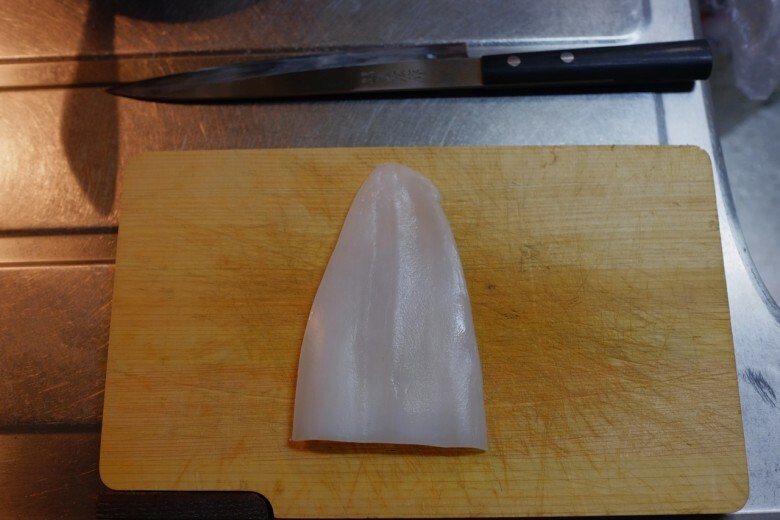 It’s sushi chef’s tradition to make deco cuts on squid meat. They make many shallow cuts just on the surface in the shape of a grid. The grid cut looks better than the flat plain white surface. It creates the edgy texture for your enjoyment on the tongue. It reserves soy sauce better in the ditch when you dip it. The squid has slippery surface and it doesn’t stick to sauce otherwise. It cuts the fine layer of film over the body. You can skin the outer layer with your hand easily. But there is another transparent film-like layer underneath. With a big squid like 3, 4kg or bigger, the film is too tough so you should take it out. But you don’t have to worry about it with a smaller squid. Still, it’s nice to make these deco cuts to break down the film. It’s not normal sashimi slice. 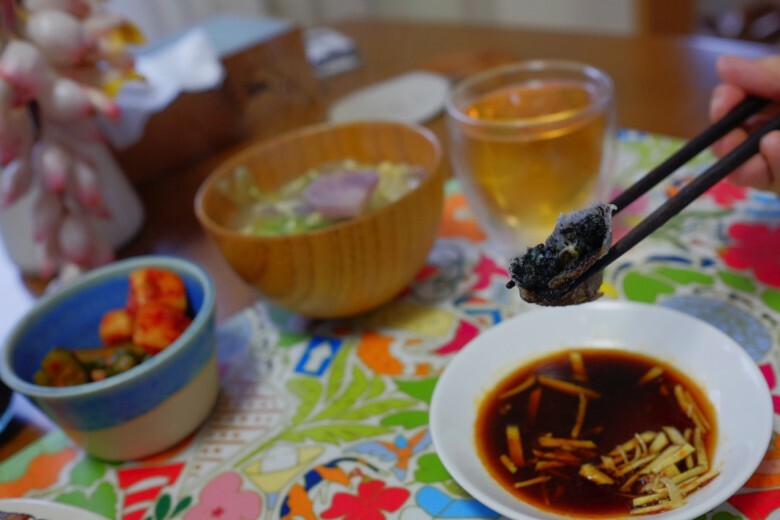 I did what we call “squid noodle.” If you look close you may be able to see the deco cuts. It was incredibly sweet. The texture you first feel is silky and firm. I assume that it’s the outside. But then you feel such tender and buttery texture. And then when you chew, the sweetness hits you. 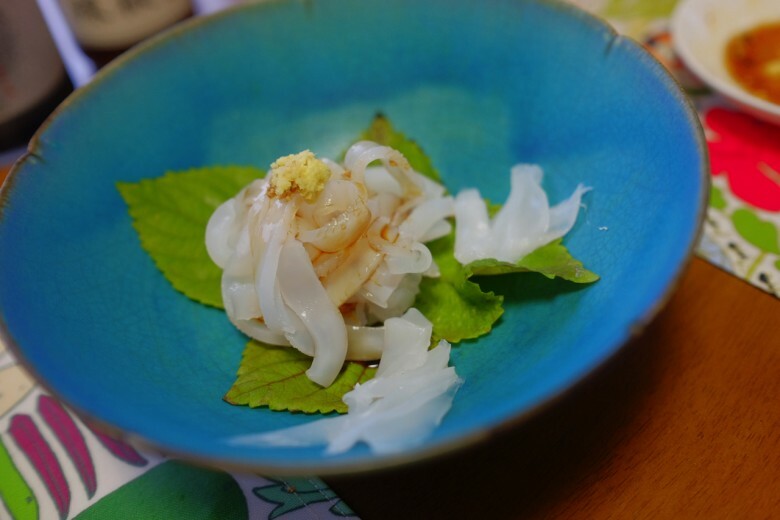 Oh… We just love squid. 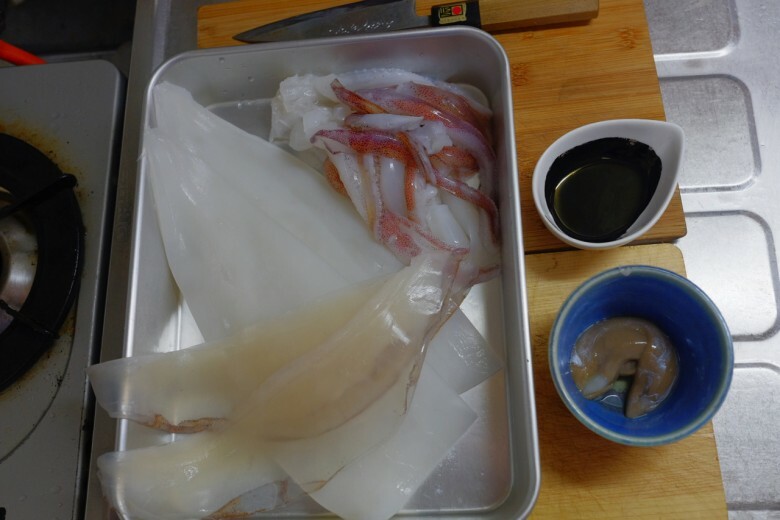 By the way, little thin slices on the side are the best part of squid. It’s filet mignon of squid. It’s inner muscle. 2 strips of muscles holding the liver. Now this is YuYu’s department. Dumpling fillings. 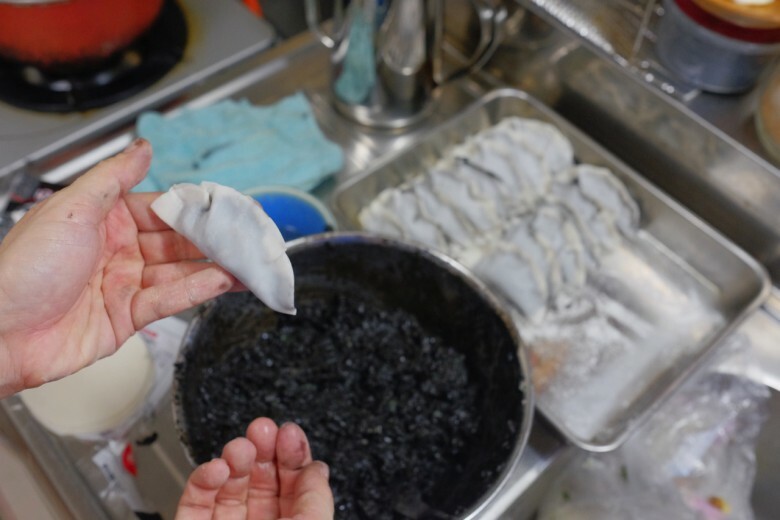 The filling is squid ink, liver, fins and tentacles, pork, nappa cabbage, garlic chive, coriander, grinded ginger, sake, and salt. No garlic. 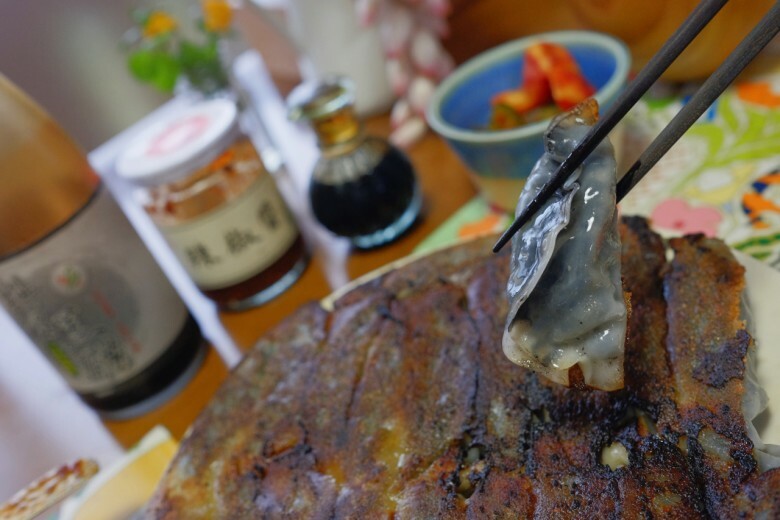 Every recipes for dumplings in Japan, Gyoza, must have chopped garlic in it, but we prefer no garlic. 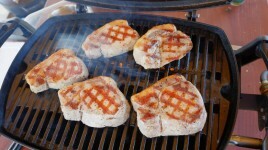 With garlic, it would taste good for the first couple of pieces, but then it would always feel too much, too edgy. This is going to be goooood!!! 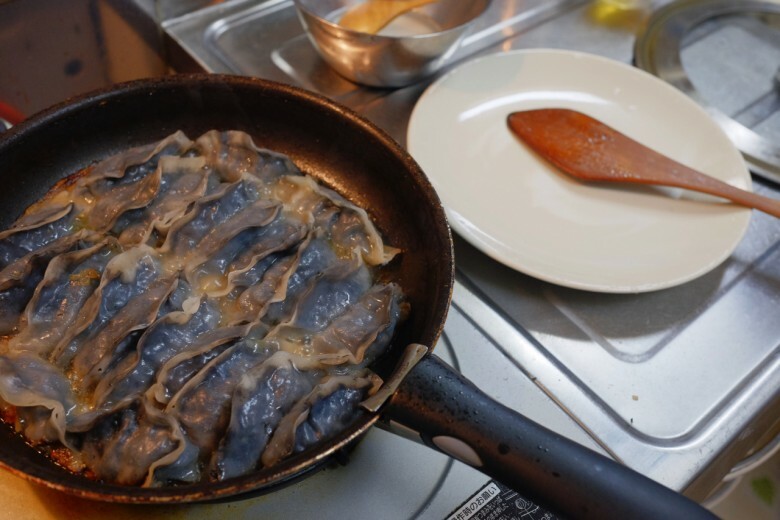 Pan-fry on smoking hot sesami oil first, add some water which is mixed with starch, simmer with a lid on, when cooked after 10 minutes, put lid off, keep it on heat until the moisture is gone and the bottom side gets nice caramelization. Put a serving plate upside down on the pan. Turn it over quick with the whole pan. This way all the dumplings will sit on the plate, fried side up, nicely without disturbance. 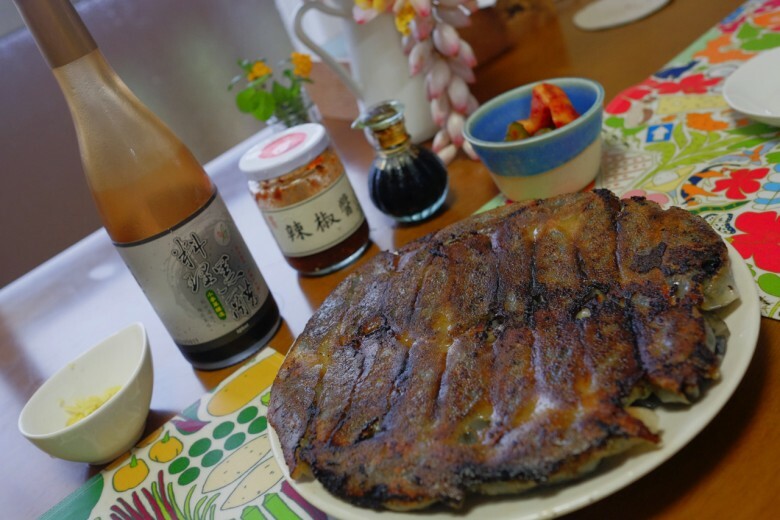 Along with black vinegar from Taiwan, hot bean paste also from Taiwan, Kimchi from Korea, strips of ginger and soy sauce. Beautifully done by YuYu. Crispy crust on one side, steamed and juicy on the other side. It was gorgeous. So much flavor from surf and turf, blended into such harmony. No fishiness. Just divine harmony. 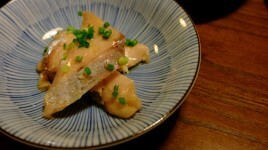 I think we are going to do Okonomiyaki with the rest of squid which now is resting in freezer.